Travel writer Stefani Jackenthal spent the past year exploring wine regions around the country for her new book Wanderlust Wining. She hit all the classic regions, of course—Napa, the Finger Lakes—but she also stumbled upon some lesser–known gems. Here are her favorite new discoveries: ten under–the–radar wine regions worth visiting. Get there before the crowds do! Where: Dubbed “D.C.’s Wine Country,” Loudoun is a quick 30–minute drive from the heart of our nation’s capital. Why go: This is the wine region for history buffs. Tasting rooms are sprinkled across historic landscapes, battle sites, and former president’s plantations. Regional specialties: For reds, you’ll find Merlot, Cabernet Sauvigon, and Cabernet Franc, along with a hefty amount of Petit Verdot—a varietal quickly gaining notoriety. For white wine lovers, there’s plenty of Viogner and Chardonnay. Winery to try: Named the “Best Winery in Loudoun County” for eight consecutive years, the family–owned Tarara Vineyard and Winery (13648 Tarara Lane, Leesburg, VA) is situated on a meticulously manicured 475-acre farm paralleling the Potomac River. They craft crowd–pleasing Charval and Rose’ ($20.00 per bottle). Where: About 90 miles north of San Francisco, Mendocino is sandwiched between the Mayacamas Mountains and the Coastal Mountain Range. It’s a remote, rugged landscape, with ancient redwood trees, lakes, and rivers. Why go: Want to sip and save the Earth? This is your place. Mendocino may be the greenest wine region in the country, with nearly 30 percent of the 40–plus wineries here growing certified organic grapes. Many ahdere to biodynamic or fish–friendly farming methods, too. Regional specialties: Mendocino’s cool climate is best for Chardonnay, Sauvignon Blanc, and Gewurztraminer. As for reds, look for Zinfandel, Petite Sirah, and Rhone blends. Winery to try: True to Mendocino’s reputation as a green winery region, Parducci Wine Cellars was the first “carbon neutral winery” in the country (501 Parducci Road, Ukiah, Calif.). Inside its red–tile roofed tasting room, the redwood–barrel bar and brick walls are a great atmosphere in which to sample their Gold–medal winning Chardonnay and True Grit Petite Sirah (from $30 per bottle). Where: Set on the western slope of the sunny Grand Valley region, Palisade is a 12–mile drive east of Grand Junction Airport on Interstate 70. 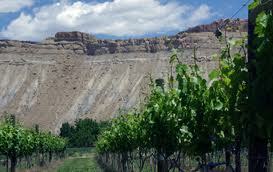 Why go: The weather here seems made for sipping: Palisade–Grand Mesa averages 290 days of sunshine annually. Regional specialties: Over the last decade, the area has become known for its lively Riesling, sturdy Syrahs and spicy Cabernet Francs. Winery to try: Look for the “Chardonnay Chicken” standing guard outside of Plum Creek Winery’s (3708 G Road, Palisade, CO) rustic tasting room. The seven–and–a–half–foot metal fowl is something of a local landmark and was created out of old farm equipment by local artist Lyle Nichols. Inside the bright, lofty barn–turned–tasting room, a redwood tasting bar takes center stage with cozy couches tucked in the corner and a quaint picnic area outback. The award–winning Riesling features peach and fig flavors, while the Merlot ($13 per bottle) is a dark-fruit delights. Winemaker Jenne Baldwin–Eaton is one of a handful of women winemakers in Colorado.